Lillith takes great care in the creation and consecration of her magickal wands. Each one is truly unique, crafted in her own studio with much patience and love. The crystals and gemstones used are hand-picked and combined with wood, leather, and other materials, to create an exceptional artifact. Every wand is cleansed and consecrated before shipping and includes detailed instructions on attuning the wand to its wielder. June 11, 2003- Reconstructing website. Constructing new site at www.geocities.com/lillithsgrove. More Wand pictures will be up soon! 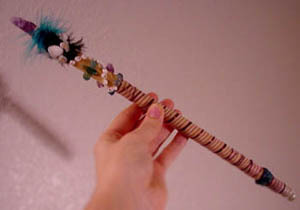 Stay tuned as the new wand designs are coming in quickly! Lillith has so much great treasures in store for you! To see what's up for sale at the grove, click on this wand pic below!